Tucked away on the border between hipster East London and corporate Square Mile is where you’ll fine Chinese fine dining restaurant HKK. 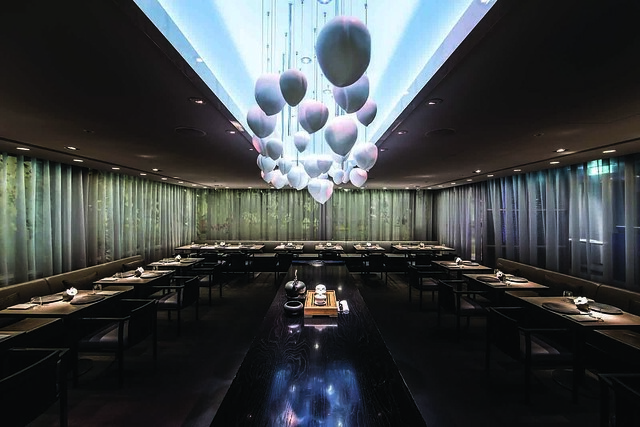 Awarded a Michelin star in 2013, less than a year after opening, HKK is led by Chef Tong Chee Hwee. The restaurant is part of the Hakkasan Group which also boasts London venues such as Sake no Hana and, of course, Hakkasan itself. To celebrate Chinese New Year and the year of the sheep, the restaurant has launched a new 10 course menu designed to take the diner on a journey across China’s famed cuisine. 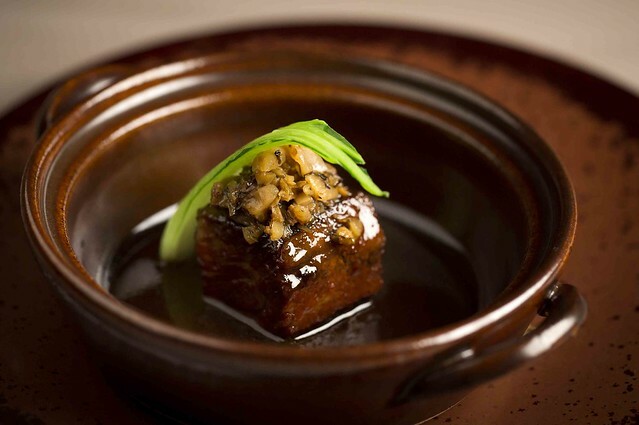 Available until the 28th February 2015, the menu is a showcase of the varying tastes available in different regions of China which is something that excites the discerning gent. Elysium Magazine heads to the hipster/corporate borders to taste a piece of the culinary action. Stepping into HKK gives the immediate first impression of walking into an upmarket nightclub. The decor is the kind of corporate slickness you’d expect for the locality but with an edginess that only the hipster realm can provide. That doesn’t mean you’ll be greeted by a myriad of neon colours and tones. Not in the slightest. Instead you get subdued hints and minimalist grandeur amongst its 54-cover dining room, a mixture of tables for two, four and larger groups that culminates with a highly impressive 14-cover private dining space should the need for client entertaining ever call. This time of the year is all about celebrating Chinese New Year and being a Chinese restaurant it would be very wrong if HKK did not follow suit. 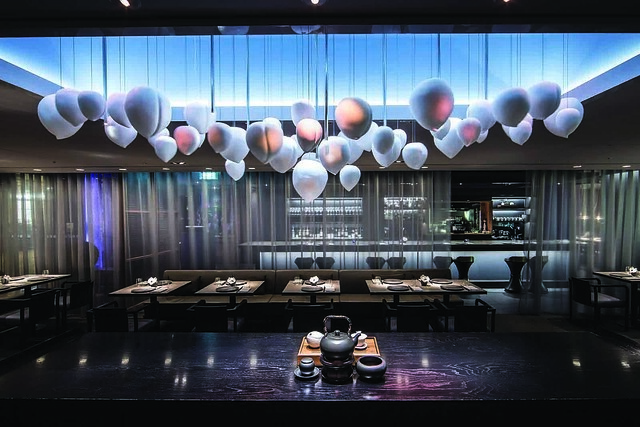 But celebrate HKK has with 10 courses – eight courses focusing on dishes from each of the Chinese provinces and two unique deserts – costing £98 per person. The total number of courses may seem high but bear in mind that it serves as a taster menu rather than a series of full dishes – that just wouldn’t be right for the discerning gent’s gym regime. The great thing about a taster menu is that the pressure of choosing from a menu is removed and there is no ‘dish comparison’ when courses are brought to the table – everyone gets the same thing. So the only debate will be over who preferred what. The meal begins with four starter courses. 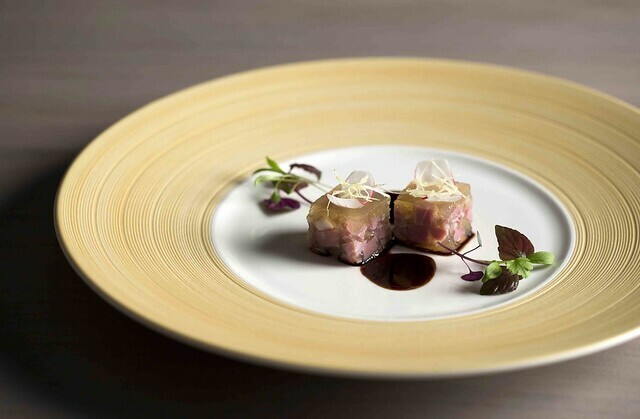 Firstly, marinated Duke of Berkshire pork with Osmanthus wine jelly from the Suzhou region – a beautifully delicate dish. Secondly, cherry wood roasted Peking duck from Beijing – a stunning dish that begins with the diner watching on as the chef intricately slices succulent duck breast with a crispy skin akin to crackling served within a pancake. Every mouthful is exquisite and you’ll be wanting more – a highlight dish. 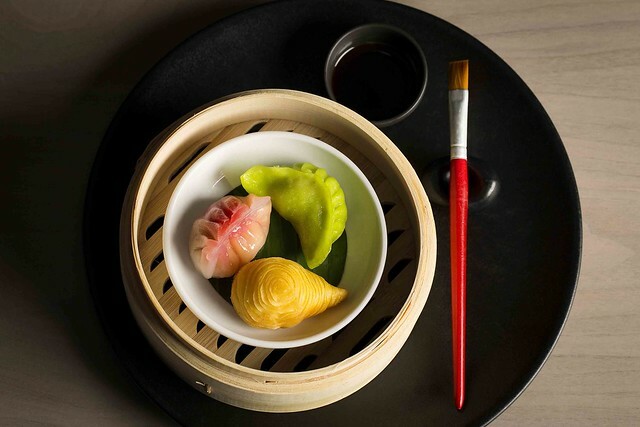 Thirdly, the dim sum trilogy from Guangdong arrives consisting of prawn with goji berry, chicken with truffle and a crab puff – interaction with the food comes in the form of a paint brush to apply soy sauce to the delicious dumplings, a nice touch. To conclude the starter courses, a soup titled ‘monk jumps over the wall’ from Fujian – a rich broth with various mushrooms, a hearty way to finish. Drinks options are available to suit tastes. HKK, like Hakkasan is known for its cocktails and there is an option to pair your meal to one, or you can opt for a wine – which was our preference. Guided by an expert sommelier you cannot go wrong. The 2012 Petalos del Bierzo was the perfect complement to the culinary journey we were on. Give yourself time to savoir each course and enjoy the wine, a recommendation Elysium Magazine advocates to any diner but more so when there are further courses to go. Never be afraid to advise your waiter if you ever need a moment to let flavours linger. Now we’re into the main courses – another four dishes – and anticipation is building due to the standards set before. First comes the pan-fried Chilean seabass in Sha Cha sauce from the Hunan region – a very fresh tasting dish and the sauce doesn’t hide the subtle taste of the fish. Secondly, jasmine tea smoked poussin from Anhui – the crispy leeks and crunchy skin of the poussin add to the taste of the soft flesh. Next was a personal favourite after the duck starter – braised king soy Wagyu beef in a merlot sauce from Zhejiang – this was beautifully tender and so succulent. Fourth, and to round off the mains was chargrilled New Zealand scampi from Szechuan – the aromatic spice providing the sweet, spicy and salty combination. Now is the time to take a breather and take stock of the flavoursome ingredients just consumed as you savour your wine or cocktails. Eight courses gives plenty to talk about and discuss – opinions will differ as tastes are analysed – food for thought this menu really is. 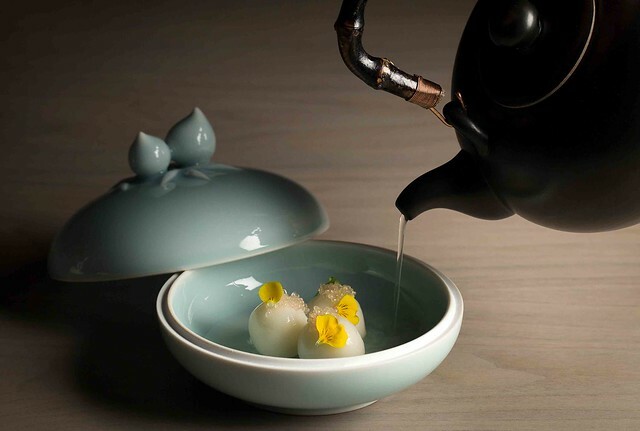 The final two courses are deserts – firstly a trio of dark chocolate dumplings with yuzu and ginger infusion – the waiter pouring the hot liquid over the dumplings adds to the theatre of the dining experience. The second is sheep’s milk mousse, pandan curd and caramelised puff rice. These are both eye-catching in the same way they are tasty – and demonstrates the technical ability of the chef. A great way to finish off an impressive menu. Ten courses could easily fill you up and it’s a good chef’s forte to ensure that the meal put together is balanced in the right way. Chef Tong displays his mastery of ingredients, flavours and portion control with these 10 courses. The duck was a particular highlight, and a signature dish of the restaurant, but the trilogy of dumplings or the Wagyu beef demands the attention of your taste buds too. The discerning gent is recommended to enjoy this celebrated menu before the 28th February, and go back after for the duck or beef.